Bulldogs pink weekend has raised almost �71,000 in five years for breast cancer charities. Batley Bulldogs have announced that this year’s Pink Wekkend breast cancer awareness fundraiser raised almost £21,000. It means the total raised in the last five years has grown to a staggering £71,091. The Pink Weekend has grown each year and Bulldogs chairman Kevin Nicholas is overwhelmed by the generosity supporters have shown. He said “Each year our fans amaze us by their generosity. The Pink Weekend is now firmly part of the Batley Bulldogs annual calendar and fans ask each year the dates of that weekend. “The idea for weekend came up at Christmas 2013 when my wife, Beverley, and I were watching Glenn McGrath’s Pink cricket match in Australia on television. 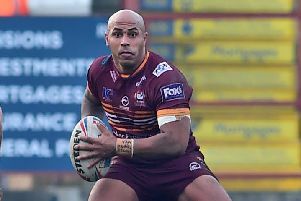 “His wife had passed away because of Breast Cancer and having known of a couple of Batley fans that had been diagnosed with this cruel disease, Beverley said that Batley Bulldogs should do something similar to raise money to support Breast Cancer charities. Each year on the Pink Sunday, the Bulldogs play in a different pink kit which immediately after the match is taken off by the players and given to the fans who have pledged money to buy them. Mr Niocholas added: “These kits are becoming something of a collectors item with some fans buying one each year but there are a very limited number made and some fans find themselves disappointed. Other fundraising events have included fans walking from Batley to Barrow and for the last two seasons, over 200 supporters have walked the 10k from London Broncos to Wembley on Challenge Cup Final day carrying collecting buckets and wearing Pink T-shirts. Mr Nicholas said: “We cannot thank our fans and sponsors enough for all they do each year. We are not aware of any other Rugby League Club that has raised so much money over five years. The Bulldogs are always looking for ideas for the Pink Weekend and anyone who wishes to support this cause then again please contact the club.